There is an eclectic mix of stories on the front pages of Northern Ireland's daily papers this morning. 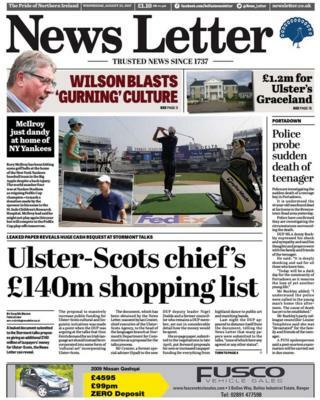 The News Letter's lead focuses on what they are calling a "huge cash request at Stormont talks". The paper has seen a leaked document detailing a proposal submitted to the political talks process aimed at restoring the Northern Ireland executive. The suggestion from the chief executive of the Ulster-Scots Agency, Ian Crozier, to the head of languages at the Department of Communities, proposes an additional £140m in funding for Ulster-Scots culture. Mr Crozier is a former special adviser to DUP MP Nigel Dodds and remains a member of the party, according to the News Letter. His paper outlined his belief that "the Ulster-Scots community is facing discrimination" and that the Irish language receives 10 times more funding than all Ulster-Scots culture combined. Staying with politics, the News Letter reports that the DUP South Antrim MP Sammy Wilson is "fed up" with MLAs "gurning", which is, incidentally, Ulster-Scots for complaining. His remarks come as a complaint against his DUP colleague Edwin Poots for allegedly breaching the Northern Ireland assembly's code of conduct was dismissed. "Why can they not just be grown up and accept that, look, in the rough-and-tumble of politics, people will say things you don't like, and you just have to live with it, rather than running to granda or daddy to reprimand people you don't like," Mr Wilson said. "Hero policeman dies in Thailand," is the front page headline in the Belfast Telegraph, the story billed as exclusive. 50-year-old Heath Taylor died in what the paper describe as a "freak accident". Mr Taylor was a friend of PSNI chief constable George Hamilton, the Telegraph reports. Devoting two pages of coverage to Mr Taylor's death, the paper reveals that Mr Taylor received a citation while a serving officer in the RUC. The Telegraph also gives two pages to political coverage as issues around Brexit and the crisis in Northern Ireland's political system begin to re-emerge after the summer break. The Irish News leads with a question for health authorities: "Why did ambulance take 10 hours to reach Jimmy (79), leaving him to die alone?" 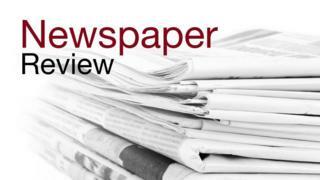 Jimmy Cassidy was found dead in his home at Brookvale Fold in north Belfast on Sunday, the paper reports. A friend, Michael O'Reilly, found him collapsed at about 19:00 BST on Saturday and called an ambulance, which, he said, did not arrive until 05:00 BST on Sunday. The ambulance service told the Irish News that it could not comment on the issue as an internal investigation in the circumstances is under way. The paper's editorial is a call to "root out sectarianism" following recent events in Londonderry, a city which has been, according to the Irish News, "a strongly positive example" for other area in recent years.